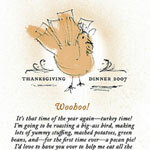 These Thanksgiving dinner invitations were made by Wendy. 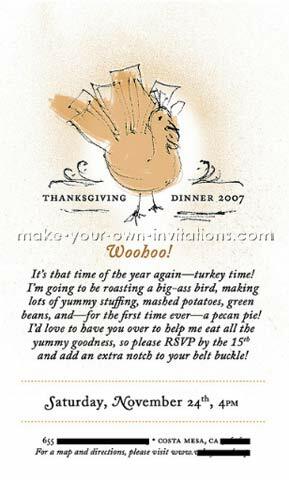 She wanted to cook dinner for a bunch of her friends, and since she is a designer the event would not be complete without invitations. Honestly, it just started off as a doodle. I like to incorporate hand-made elements with digital ones, so I doodled the turkey, then scanned it in to my computer and used a variety of brushes in Photoshop to add color and texture to the card. The wording was added in photoshop as well along with a couple of dotted line dividers. What I love about a grungy illustrative style is that you don't have to be perfect! Sometimes mistakes can make the invitation actually look kinda cool! When I sketched this turkey I had no idea it would be the center of my future illustration. All I was focused on was having fun and doodling.